Edwards, W.H.B., “Growth Factors and Colonic Mucosa. An in vivo study of factors controlling the growth of colonic mucosa in rats” University of Melbourne Master of Surgery Thesis, 1993. Edwards, W. H. B. & Whitehead, R., “The effects of Vesicocolic Anastomosis on the Proliferation of Colonic Mucosa in a Rat Model” in The Australian and New Zealand Journal of Surgery; 1995,65,667 – 671. Myerson, M.E. and Edwards, W.H.B., “The Etiology and Pathogenesis of Hallux Valgus in Foot and Ankle Clinics”, Volume 2 Number 4 pages 583 – 598. Edwards, W.H.B. “Avascular necrosis of the first metatarsal head”, Foot & Ankle Clinics North America. March 2005 Volume 10. R. Salleh, A. Beischer, W.H.B. Edwards – “Disorders of the hallucal interphalangeal joint”, Foot & Ankle Clinics North America. March 2005 Volume 10. W.H.B. Edwards – Epworth Hospital Graduate Nurses Orthopaedic Short Course “Ankle Surgery” Friday 10 June 2005. Leslie, Hamish D.H., Edwards, W.H.B., “Neglected ruptures of the Achilles tendon”, Foot & Ankle Clinics North America. June 2005 Volume 10. W.H.B. Edwards – Baltimore fellows Foot and Ankle Meeting, Steamboat Springs, Colorado USA. “Australian’s do it better” March 2009. W.H.B. Edwards – AOPA Victorian Section, St Vincent’s Hospital Melbourne – “Foot and ankle neuroarthopathy – Charcot disease” 13 May 2009. W.H.B. Edwards – Australian Foot and Ankle Meeting, Gold Coast, Queensland “Ankle Fusion” August 2010. W.H.B. Edwards – AOA Vic Branch AGM, Lorne Victoria. “Lisfranc Injuries” February 2011. W.H.B. Edwards – Alfred Hospital Bone School. RACS Melbourne, “The diabetic ankle fracture” and “Lisfranc injuries and Compartment Syndrome” 6 May 2011. W.H.B. 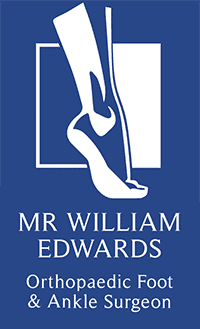 Edwards – Cotham Private Hospital – An update on Shoulder, Hip and Foot Complaints. “Examination for Commonplace Problems of the forefoot” 16 May 2012. W.H.B. Edwards – AOA Sporting Injuries – Back on track, Parkroyal Melbourne Airport, Melbourne. “Lisfranc Injuries” 19 July 2012.